The DK First Spanish Dictionary is a fantastic resource for children aged 7 years and over, that teaches 2000 first Spanish words. At the beginning of the book there are topic pages that include lots of useful words on a particular subject, presented through photographs of everyday objects, labelled with both their English and Spanish names, together with a guide to pronouncing the Spanish words. 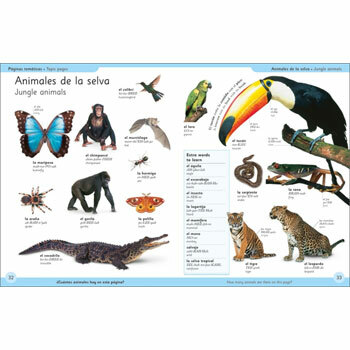 There are also English-Spanish A-Z and Spanish-English A-Z pages that work like a traditional bilingual dictionary, allowing children to quickly access a word and find its translation, as well as a section of useful Spanish phrases to learn. • All about Me • Clothes • Home and Garden • City Life • In the Park • Hobbies • Food & Drink • Shopping • Animals • Nature • Beach • School • Sports • Colours • Shapes • Opposites• Weather. 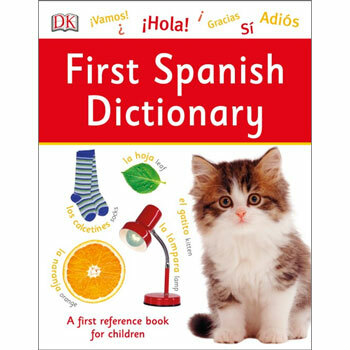 The DK First Spanish Dictionary is aimed at young Spanish beginners from ages 7 - 12 (Key Stage 2 and Key Stage 3) and is perfect for parents and teachers who are keen to teach children Spanish as a second language. No previous knowledge of the language is necessary as pronunciation guides are included. This book is published in the UK and uses Castilian (European) Spanish.